Busy Monday. I don't know about the rest of you, but we are back with a vengeance at my school. A vengeance. I did manage to crawl out from under a pile of paperwork today to have a guest speaker in Sociology. But it went well. Better than well, actually. The speaker was engaging and offered a real-world perspective that I cannot offer. The students paid attention and asked thoughtful questions at the end. It made me wonder--why have I not had a guest speaker before? What have I been waiting for? I know I can't offer my students everything they need to understand real-world applications of my subject. I'm only a teacher, after all, and that's just about all I've ever done. Honestly, I think I'm a little afraid of giving up control. What if the speaker is boring, or worse, the students are rude? But today made me realize that's not fair to the students or the community. I don't need to underestimate any of them, and how will they become productive citizens if they don't connect to their community? So, my challenge to myself--make connections, and have more guest speakers. The students had to take a break from their research projects, which are quite a bit of fun, by the way. I'm going to discuss them in detail next week. They involve the students getting out into the school and conducting experiments and/or surveys. 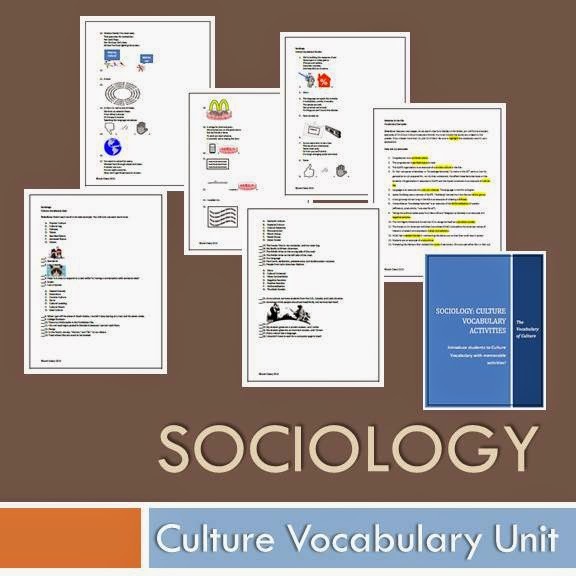 I'll also offer the materials for you to make it happen in your sociology class. Do you invite guest speakers into your classroom? Leave a comment below, and let me know how you work it out! A week and a half and the honeymoon's already over. The students are getting comfortable, and their true personalities have emerged. I'm okay with that, though. This is when it gets interesting. Not one of my sociology students was prepared for the test today, I realized, as we were playing the review game. It was time to check my type A at the door and roll with the punches. I stopped the game and assigned each group a concept and a sociological theorist to research and present to the class. We're taking the test tomorrow. In a situation like that, I'm conflicted. They knew the test was today. They should have been prepared. Do I really want to set the precedent of giving into their slacking ways? The honeymoon's over in my world history classes, as well. But the Interactive Notebook format is working amazingly well. The thing is, at this point, I'm used to feigned interest falling away and materials being left on kitchen counters (but never their smart phones). This is the point when I say, "Take out your notes on India," and several of them stare at me blankly, while I cut short excuses for why they don't have them. They're talking more, as usual, and getting bolder in their behavior, but in a week and a half, only one student has forgotten his notebook, and that was only once. There have been no missing papers at all. I am sold on the Interactive Notebook. The students own these, and they like them. WOW. 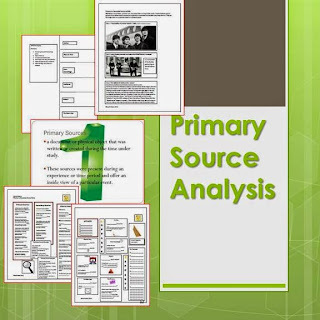 We use this throughout the entire course to analyze documents. Its a real time saver, and it gets the students used to working with primary sources. 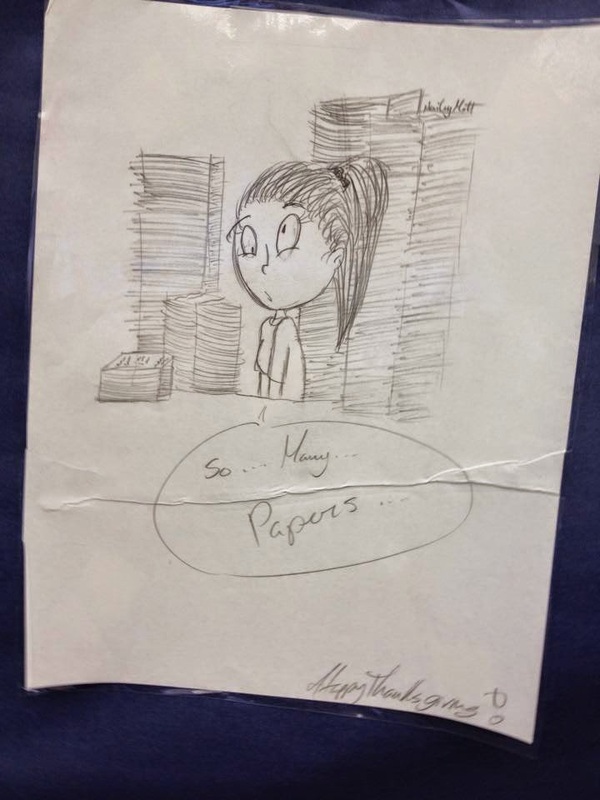 Have you ever thought all was well only to discover that your students were completely clueless? Leave a comment below to let me know how you dealt with it. It hasn't been quite a full week, yet--our students returned last Wednesday--but we are going along full steam (English teachers, forgive the cliche; I'm too tired to think of something original). What an (almost) week it's been! - It took a lot of precious time to set up (the history of the world in 18 weeks? No time to spare!). - 30 10th graders, all waiting for instructions--you know they didn't wait, and there were plenty of mistakes. - The pictures I took for my blog--they didn't turn out. - Today, every student, except for one (out of 60) had their notebook with them in class. This is phenomenal! 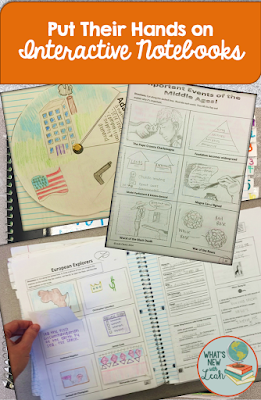 - By the time the bellringer was over, most of them had already pasted the handouts I had for them to pick up on the front table when they came into class, on the appropriate page in their notebook. - When I said, "Turn to page 9 so we can finish your notes on Egypt," everyone turned, and we were on the same page. No time wasted looking for rogue papers. - They seemed to actually enjoy working on their vocabulary activity in the notebook, as opposed to doing it as a separate worksheet. The verdict? So far, the pros outweigh the cons. 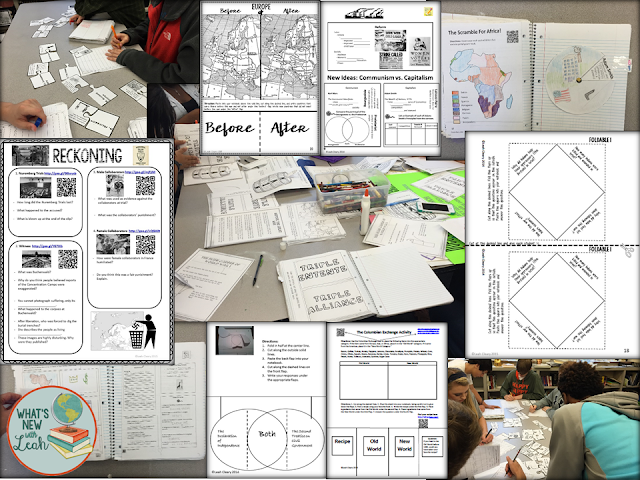 I will keep you posted, but I am definitely revamping the rest of my units to the interactive notebook format. 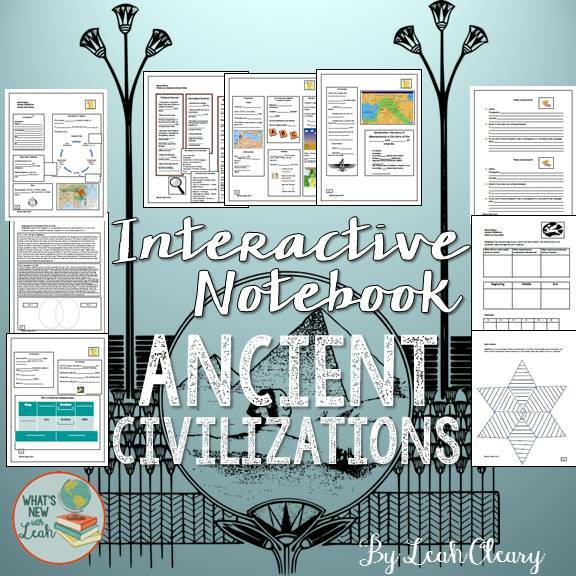 You can get a copy of my unit 1, Ancient Civilizations here. What's your opinion? Leave a comment below and let me know if you've had any successes (or failures) with the interactive notebook. Sounds daunting, right? Well, it is, a little, when you're first starting out. These things have been around since the 70s (so the technology involved is a xerox machine and a bottle of glue--no dittos, please), but they seem to be all the rage, lately. I have been teaching for 13 years now, seven of those dedicated to world history. For the past two years, I can honestly say that I've been pleased with my classroom structure and routine. The once overwhelming content is now manageable. I've finally learned to streamline--an essential skill when you have to teach Ancient Mesopotamia all the way up to today in 18 weeks! So why would I want to completely overhaul my course? But the more I read about interactive notebooks, the more intrigued I became. And now, I'm committed. 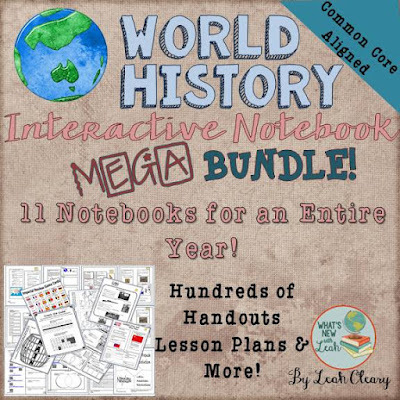 I'm revamping all 12 of my world history units into an interactive notebook format. Preparing and organizing the materials is the tough part. The execution is surprisingly simple. Students purchase a notebook (for my class's purposes, an 8 1/2 x 11 100 page spiral notebook is best). They dedicate a few pages at the front to classroom management stuff (syllabus, behavior plan, etc...). They number every page, front and back (I have them do it one unit at a time and separate each unit with tabs). I provide them with a table of contents for each unit (or they can make one). They glue documents, handouts, and notes into the notebook. The interactive part is that they work with them right on the same or opposite page. The beauty of this system is that you can say, "Okay, everybody, turn to page 15." And, voila! No digging around for a crumpled up paper at the bottom of their book bags, no rifling through a three-ring binder that's supposed to be for history but also has last year's math homework in it. A PowerPoint presentation complete with film clips with instructions on how to set the notebook up. Here's a preview of units 7-11 in action. Preview all of my world history interactive notebooks HERE. 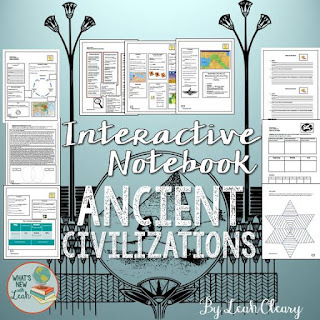 Have you ever implemented interactive notebooks? How does (or did) it work for you? Leave a comment below, and let me know! 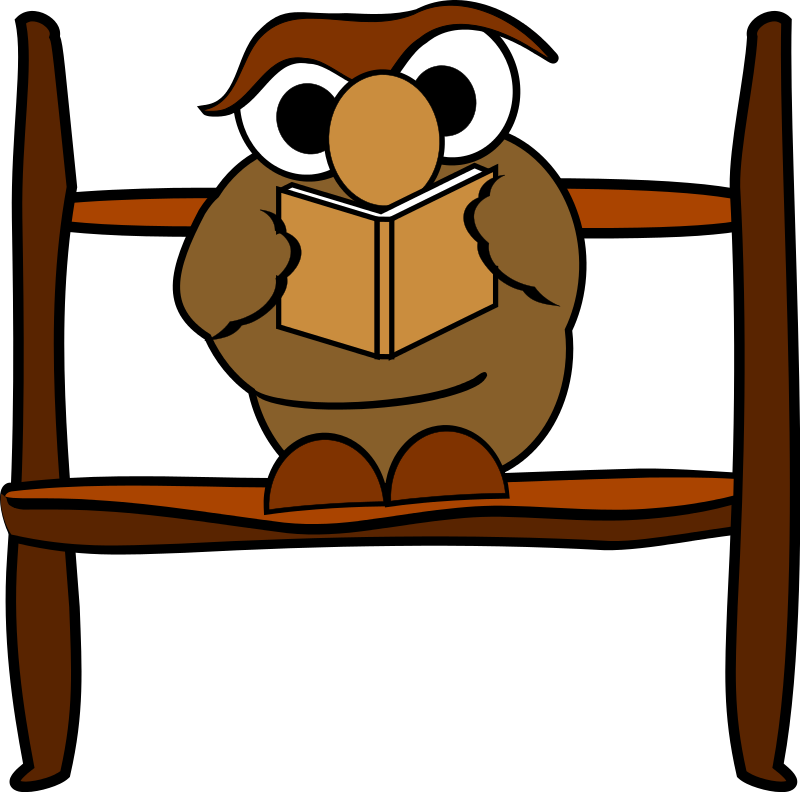 Stay tuned for next Monday, when I discuss how the first week with the notebooks went! Guest Speakers, Research, and Notebooks, Oh My!